I saw this post referenced at The Simple Dollar and it brought back fond memories. The first time our wife and I went without grocery shopping last year, we went a little over 7 weeks without buying anything. At that time, we were actually using powdered milk for drinking, so didn’t even need anything as far as perishables were concerned. We did it again late last year and lasted about a month, though there was a little more cheating involved as my wife was diagnosed with a gluten allergy and requires more fresh foods. Due to some upcoming concerns about our budget, we have decided to give it another shot. Our pantry is packed full, we have a freezer that has a hundred pounds of meat and chicken in it, and a cooler stocked with water and Gatorade. The only thing I usually find myself wanting and running out of is chocolate. However, I think the wife has some cake mix and I stashed a box of Chips Deluxe last week after a buy-one-get-one event at Publix, so I hope I’ll be ok for sweets. I mentioned that we had so much, we could probably go more than a month, but she’s drawing the line right now, so we’ll see! For a more thorough example of one families adventure in non-shopping, see this series of posts! Wish us luck! I’m scheduled to be interviewed on the Dr. Prepper Show, the number one Preparedness Podcast, in the near future. As I talked to Mr. Stevens (Dr. Prepper) a little earlier this week, I started to think about the types of questions I might be asked or areas I’d like to discuss. One thought kept coming back, and that was ‘Why am I here, writing about preparedness and selling food storage products?’ I don’t remember waking up one day and say, “Geez, I need to be selling me some Mylar Bags!” (Actually, it did kind of happen like that, funny as that sounds; that’s a story for another time!) However, I do believe there is a reason my life is moving in a particular direction; I can’t divine the purpose, and perhaps I’m not meant to. All I know is I’m doing something I love, meeting a ton of great people, and with hope, helping some folks along the way. While I have strayed pretty far from my original intent for the blog (a post every day, for example), my overall focus is the same…provide a sane, safe place to learn the very basics of preparedness. While some emphasis would be placed on food storage, as that is one area I have some expertise (though by no means do I consider myself on par with the folks who have been doing this as long as I have been alive), there would be plenty of other topics discussed as well. Provide a sane, safe place to learn the very basics of preparedness. Provide quality products at great prices, and provide a space to demonstrate the proper usage of those products. Talk a little bit about finances, personal discovery, and growing as an individual and member of a community, and how that relates to living prepared. I am making concrete steps toward those goals, and I plan to expand on them in 2011. First, I’ve found some time to squeeze out some writing for the blog; I’ve also introduced Advice and Beans on Facebook. The interview with Dr. Prepper will, with hope, provide some momentum in terms of understanding what the audience is looking for. We are working on some pretty important site design changes, including a quick link at the top of the page that will open to a Food Storage FAQ and instructional page (I will have a basic page up before the interview!). I am also exploring options for a new WordPress theme. I like our current theme, but I’m not sure it meets our current and future needs. I believe a 2-column theme will give us more actual space to work with instead of having an entire column devoted to the date of posts. We will also look for a theme with quicker load times, as I recognize that is an issue for some people (including me). At the store, we continue to expand our offerings. That will very quickly require us to upgrade our shopping cart software, which only supports 20 SKU’s. I’ve also heard from customers the checkout mechanism could be easier, so I hope to address some of those concerns. And in terms of non-preparedness writing, I want to spread some good news in terms of the benefits of frugality, how I built a business from scratch (and how you can too), and why living a socially interconnected life can be one of the greatest benefits in terms of preparedness. Looking forward to a great year 2! I have had a blast starting up Advice and Beans, sourcing products, blogging, marketing, shipping thousands of packages and working 80 or 90 hours a week. I love finally doing something for myself, and I love that I can help so many others at the same time. However, some days the noise becomes nearly overwhelming. To help clear my head, check off a box on the bucket list, and to get to know this great country just a touch better, this fall I am going to spend a week or a little more on the Appalachian Trail. My plan is to hike 70-90 miles. While some may not call it preparedness per se, I predict the lessons and learning from accomplishing such a task, will provide value to to those following my progress here as well as in my own life. I’ll admit planning is not my strongest trait, so I will make a series of posts about my progress on various tasks necessary to accomplish the goal; writing about it holds me accountable and provides a venue for others to provide suggestions and insight, and reminds me of things yet to do. Initially, my focus will be on 5 sub-goals. Fitness covers my physical ability to accomplish the task. Today I am quite a bit overweight and I haven’t hiked in almost a year; my blood pressure is running a little high. I need to address each of those in the next 6 months. Gear is what I will take with me. I estimate I have half or more of the gear I will need. I have a great pack, an excellent sleeping bag, a Jetboil stove, a Katadyn water filter and some other items. I have 2 pairs of good boots. For anything else, I will need to make well-researched choices about what other items will need to be on the trial with me. Planning will cover a couple of topics. First, what will my route be on the trail? How far should I get each day? What are the normal weather conditions for where I will be, and what are the worst case scenarios? Who do I need to inform, whether forest services or other law enforcement, of my trail route and expedition times? At the same time, i will need to plan for what happens when I’m gone. Who will run the business, ship packages, manage inventory and pay bills? What will they do if they run into a situation out of the ordinary? How will they handle customer service issues? Logistics is just another word for more detailed planning. Who will take me to my start point? How will my vehicle make it to my end point? What day will I leave? What day should I reach my destination? Finally, sustenance is the food and water I will need to make the trip. Can I carry that much with my gear? Should I set up a drop cache along the way? Will I boil, use a filter, or use another method to purify drinking water? This one will be particularly tricky, as I know on a hard hike before I’ve used my entire 5-liter allotment that I generally carry (3 liters in a bladder and 2 more in Nalgene’s) in less than 1 day. There is also a matter of communication, and this might be a combination of gear and planning. I’ll take my GPS, but what about a satellite phone or emergency beacon? I don’t know yet, and so I will have at least one post on just communications and emergencies. While that is a lot to accomplish, I also have a number of resources. I have a good friend who is an Eagle Scout who has hiked the Appalachian before, as well as a number of multi-day hikes at state and national parks. I have trained for a half-marathon, and I might look over my notes and training schedule as a guide to how I might plan for a week-long trip. There are innumerable blogs, magazines and websites devoted to hiking and camping, and we have an REI store nearby that holds regular monthly meetings on various topics. On several occasions I’ve seen them cover overnight hiking. Next post on the subject I will cover preliminary planning. What dates will I go, at least which state I will hike in, and what the expected conditions on the ground should be at that time. I am greatly looking forward to sharing my journey. It includes 9 Awesome 1-Gallon buckets, 10 – 1-Gallon Mylar Bags to put in the buckets, and 20 – 300cc Oxygen Absorbers to go in the bags. 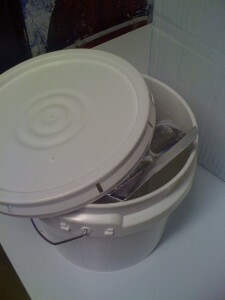 When I got a look at the buckets for the first time last week, I was very impressed, and not just because I am selling them. At our house, my wife has already said we will use them for any number of things, including storing tools or knick-knacks as well as for smaller quantities of flour or sugar. They are solid, have read plastic and metal handles, and come with gasket seal lids. You may purchase the combo for $51.99 by clicking the Paypal Button immediatley below ! Let me know if you have any questions at public@adviceandbeans.com. The AdviceWife is right, this meal was excellent. Considering she tells me that I will starve at the end of the world for lack of Pop-Tarts and Grilled Cheese, that’s saying something. I’m definitely the pickiest person in the house, but I do love pasta and chicken, so the Chicken Tetrazzini was a good first choice food storage meal. Specifically, the pasta was a touch too al dente for me, but that is more likely my wife’s taste than any fault of the dish. I warmed up 2 servings of leftover’s on Saturday and Sunday, added a touch of olive oil and chedder cheese, and it softened up to exactly the consistency I like. I wouldn’t have known it was rice pasta unless it was mentioned in the original post. Any time we can eat a great meal and avoid my wife’s gluten allergy, that’s a signficant bonus. The meal tasted excellent, and did include two servings of vegetables from our food storage as well (green beans and corn, both $.35/can at HG Hills!) and one not-quite-home-made item in a perfect serving of garlic bread. Chef T rates this 4 stars! You are currently browsing the The Food Storage Blogblog archives forFebruary, 2011.